This map was tweeted from the account of the Intl. 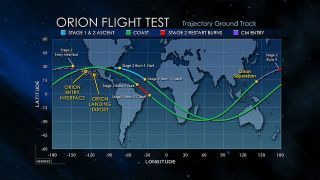 Space Station, featuring a map showing the trajectory ground track of the Orion flight test, postponed until Dec. 5, 2014. Update for Dec. 5 at 12:45 p.m. EST: NASA's Orion space capsule has passed its first test flight with flying colors after a smooth launch and even smoother splashdown. Today. See how the 4.5-hour Exploration Test Flight 1 mission unfolded here. America has a new spaceship as NASA's Orion spacecraft passed its first unmanned test flight on Friday, Dec. 5. See how the mission unfolded from its launch in Florida to a smooth splashdown in the Pacific Ocean. Orion, NASA's first space capsule since Apollo, splashes down in the Pacific Ocean after a smooth test flight on Dec. 5, 2014. With a mighty roar, a Delta 4 Heavy rocket launched NASA's first Orion spacecraft on a test flight to check major systems. The unmanned launch marked the beginning of NASA's first deep-space mission with a crew vehicle since December 1972. See launch video of NASA's Orion spacecraft as it blasts off atop a Delta 4 Heavy rocket on the Exploration Flight Test 1 mission. It's Round 2 for NASA's Orion spacecraft as the space agency attempts to launch its first new space capsule in more than 40 years. Here's how to follow it online. Stuck fuel valves on its Delta 4 Heavy rocket prevented NASA's first Orion spacecraft from launching on the Exploration Test Flight 1 mission on Dec. 4. Here's what happened. The launch debut of NASA's first deep-space capsule in more than 40 years will have to wait at least another day after a series of delays thwarted repeated liftoff attempts on Thursday (Dec. 4). Do Orion and SLS only exist to provide jobs on Earth? Is Orion a capability without a real mission? Could Orion fly atop a SpaceX booster?NASA Chief Maj. Gen. Charlie Bolden handles these and others with Space.com’s @DavidSkyBrody. The countdown has begun for the first test flight of NASA's Orion spacecraft. Here's our own by-the-numbers countdown for Orion. Orion, NASA's new manned spacecraft, is all set to make its first uncrewed flight test on Thursday, Dec. 4. Here's the latest from NASA. Space.com's @TariqJMalik and NASA's @Astro_Ricky talk to the furry little sesame street character about the Exploration Flight Test 1 (EFT-1) mission at the Kennedy Space Center in Florida. NASA and the U.S. Navy plan to launch at least five other aircraft along with the Orion space capsule to monitor and record data from Thursday's mission. The first test flight of NASA's new Orion spacecraft this week marks a critical step on humanity's journey to Mars, agency officials say. NASA's landmark Orion spacecraft test flight this week will cap one of the largest social media campaigns in the space agency's history. Here's why. When you think of NASA, you don't usually think Hollywood, but several actors — and even Muppets —have pledged their support for the Orion spacecraft test flight. NASA's Dec. 4 test of its Orion space capsule comes with many risks and rewards. Here's how the daring test should work. See how NASA's Orion EFT-1 space capsule test flight will work in this step-by-step guide from the U.S. space agency. NASA's first Orion spacecraft test flight will launch icons of science fiction when it blasts off on Dec. 4. What's aboard from Star Trek, Marvel and more. The 'dashboard' or user interface of NASA's next-generation capsule will have a digital display. The capsule will also have about 60 physical switches. Officials are predicting a 60 percent chance that weather will be favorable for the Orion space capsule's first test flight scheduled for Thursday (Dec. 4). A spaceship built to carry humans is about to venture into deep space for the first time in more than four decades. Learn how to watch many of the events leading up to the first test flight of NASA's Orion space capsule live online all week. "Sesame Street's" beloved muppets have joined forces with NASA to promote the space agency's test flight of the Orion capsule on Dec. 4. Officials have given the Orion space capsule a "go" for its unmanned test flight expected to launch next Thursday (Dec. 4).